Elizabeth Ebert, known to some as the Queen of Cowboy Poetry, has passed away. 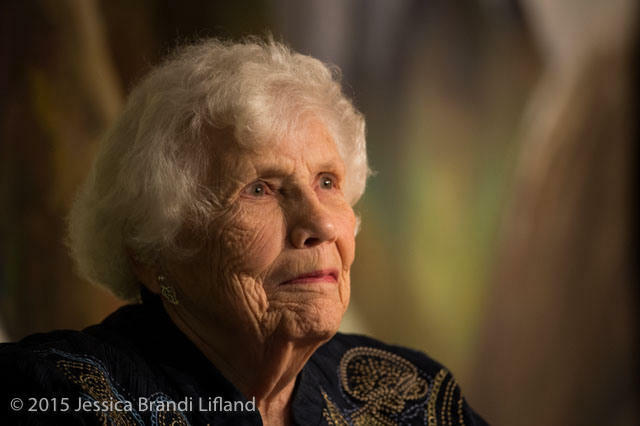 The 93 year old spent most of her life near Lemmon, South Dakota. During her later years, she traveled the country to recite her poetry. I recently visited with Elizabeth Ebert in her rural home. She shared her journey with cowboy poetry over a cup of coffee. Many of her memories were of the early days. She was a ten year old in South Dakota during the Great Depression. Ebert grew up reading poetry and started writing her own when she was four. But for years she crumpled up her work and threw it in the trash. She was 65 when she recited her first original poem on stage. There was only a small audience at that first show. Then Ebert says she met a mentor in North Dakota who showed her how to get her name out into the world. Nearly twelve hundred people attended that event. Ebert says after that, she recited her work all over the country--and once overseas. She says she earned the nickname the Queen of Cowboy Poetry. Ebert says traditional cowboy poetry isn’t about politics or religion. It’s just about life. She says it’s usually really funny or really sad. She prefers her serious work--pieces focused on homesteading days and early cowboys. Some of Ebert’s poems are personal but she says she doesn’t write about friends and family. To her, the rhymes are the most important thing about cowboy poetry. And--she has plenty. Ebert always kept her favorite writing tool with her--a dictionary. She says modern cowboy poetry is more focused on the issues and trends in society and sometimes it doesn’t even rhyme. Ebert says her favorite poems are light hearted or simple---like life should be. Ebert is survived by her three children, six grandchildren and eight great grandchildren.